Spring has finally sprung and that means it’s time to unleash the awesome German bocks and whatnot that have been lagering since Winter just waiting for the call to help us all celebrate. Our latest release, “Oh, Brother!” – a Maibock crafted in collaboration with Key Brewing Co. – is the perfect beer for the job. In fact, we’re throwing it a little party Friday, May 11th, 2018 to welcome it to the fam, fam. Do you value traditional marriage? 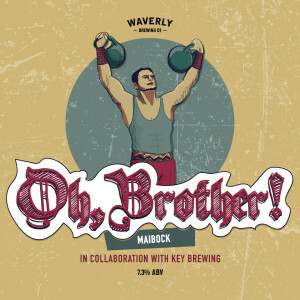 We don’t frankly care, but Waverly & Key Brewing had a beautiful baby together. This traditional German May beer is a celebration of Pils and Munich malts kissed with floral springtime hops. Brewed in winter…and then we lagered the helles out of it. In loving memory of Dylan K. Yukna.